Many new types of definitive Romanian stamps were issued between 1872 and 1889. All of the definitive stamps of this period feature the portrait of Domnitor or King Carol I. 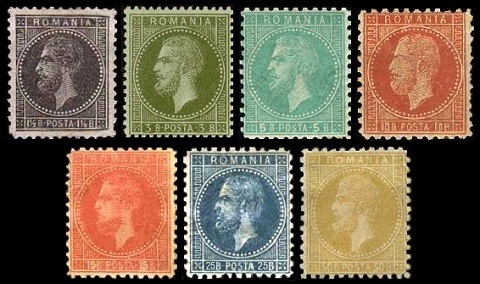 The seven new portrait definitive Romanian stamps shown above were issued in 1872. They are printed on tinted paper, and they are perforated 14 x 13 1/2. These stamps, with fine impressions, are known as the Paris Printing. The frame designs are very similar to the contemporary French definitive stamps of the time. 01 1/2 B. (1872 - Sc. #53) - Bronze Green on Bluish. 03 B. (1872 - Sc. #54) - Green on Bluish. 05 B. (1872 - Sc. #55) - Bister on Pale Buff. 10 B. (1872 - Sc. #56) - Blue on White. 15 B. (1872 - Sc. #57) - Red Brown on Pale Buff. 25 B. (1872 - Sc. #58) - Orange on Pale Buff. 50 B. (1872 - Sc. #59) - Rose on Pale Rose. 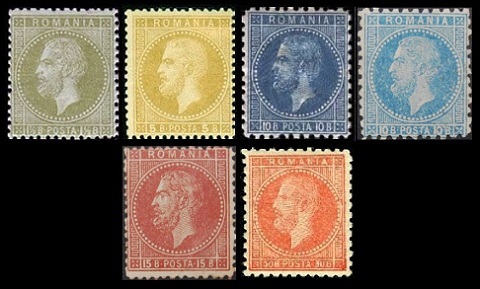 These six Paris-Printing-Type portrait definitive Romanian stamps of 1872 shown above were issued between 1876 and 1878. They are printed on tinted paper, and they are perforated 11, 11 1/2, 13 1/2, and also compound. These stamps, with rough impressions, are known as the First Bucharest Printing. 01 1/2 B. (1876 - Sc. #60) - Bronze Green on Bluish. 05 B. (1876 - Sc. #61) - Bister on Yellowish. 10 B. (1877 - Sc. #62) - Blue on Yellowish. 10 B. (1877 - Sc. #63) - Ultramarine on Yellowish. 15 B. (1876 - Sc. #64) - Red Brown on Yellowish. 30 B. (1878 - Sc. #65) - Orange Red on Yellowish. These seven Paris-Printing-Type portrait definitive Romanian stamps of 1872 shown above were issued during 1879. They are printed on tinted paper, and they are perforated 11, 11 1/2, 13 1/2, and also compound. These stamps, with rough impressions and changes in color, are known as the Second Bucharest Printing. 01 1/2 B. (1879 - Sc. #66) - Black on Yellowish. 03 B. (1879 - Sc. #67) - Olive Green on Bluish. 05 B. (1879 - Sc. #68) - Green on Bluish. 10 B. (1879 - Sc. #69) - Rose on Yellowish. 15 B. (1879 - Sc. #70) - Rose Red on Yellowish. 25 B. (1879 - Sc. #71) - Blue on Yellowish. 50 B. (1879 - Sc. #72) - Bister on Yellowish. 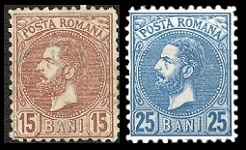 The two portrait definitive Romanian stamps shown above were issued during 1880. They are printed on white paper. 15 B. (1880 - Sc. #73) - Brown. 25 B. (1880 - Sc. #74) - Blue. 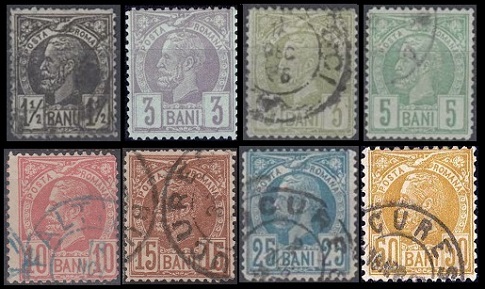 The eight major-type portrait definitive Romanian stamps shown above were issued between 1885 and 1889. These are referred to as the "Vulturi" or "Eagles" Issue. The Scott catalog attributes, for stamps that are printed on normal, white, unwatermarked paper, are as follows. 01 1/2 B. (1885 - Sc. #75) - Black. 03 B. (1887 - Sc. #76) - Violet. 05 B. (1888 - Sc. #77) - Green. 15 B. (1885 - Sc. #78) - Red Brown. 25 B. (1885 - Sc. #79) - Blue. 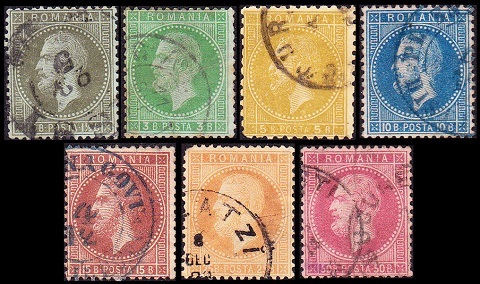 The Scott catalog attributes, for stamps that are printed on normal, tinted, unwatermarked paper, are as follows. 01 1/2 B. (1889 - Sc. #80) - Black on Bluish. 03 B. (1887 - Sc. #81) - Violet on Bluish. 03 B. (1885 - Sc. #82) - Olive Green on Bluish. 05 B. (1886 - Sc. #83) - Blue Green on Bluish. 10 B. (1886 - Sc. #84) - Rose on Pale Buff. 15 B. (1887 - Sc. #85) - Red Brown on Pale Buff. 25 B. (1887 - Sc. #86) - Blue on Pale Buff. 50 B. (1885 - Sc. #87) - Bister on Pale Buff. The Scott catalog attributes, for stamps that are printed on thin, yellowish paper that is watermarked Coat of Arms, are as follows. 01 1/2 B. (1889 - Sc. #88) - Black. 03 B. (1889 - Sc. #89) - Violet. 05 B. (1889 - Sc. #90) - Green. 10 B. (1889 - Sc. #91) - Rose. 15 B. (1889 - Sc. #92) - Red Brown. 25 B. (1889 - Sc. #93) - Dark Blue.